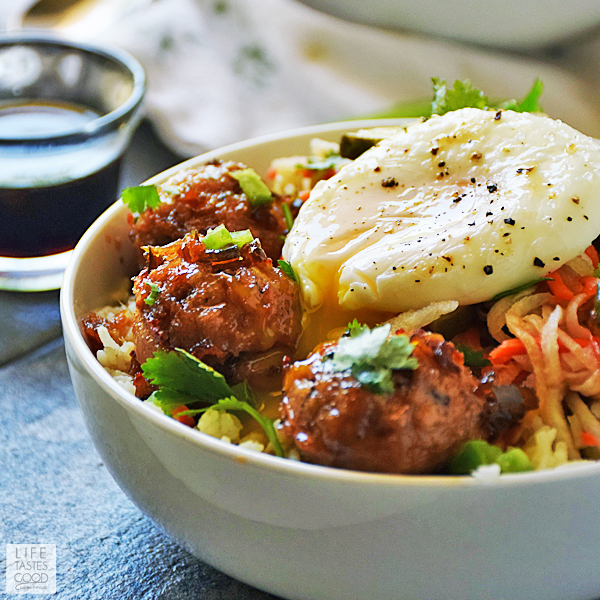 The best way to describe my Vietnamese Bowl recipe is AH-MAZING! That doesn't really tell you what it is though, so think of a Vietnamese Banh Mi sandwich where you take all the insides and put them over rice and then top it with a poached egg. Can you imagine?! Best of all it's an easy recipe using fresh ingredients to maximize flavor! When Don & I sneaked away to St. Petersburg, we went to this little Vietnamese place after we watched the sunset. It was pretty late, but we wanted a Banh Mi sandwich, so we had to do it. When I was ordering, the waiter asked me if I wanted to put an egg on it. What? You can do that? and then he said what I always say, "everything's better with a runny egg on it!" Yes, it is, sir. Yes, it is! Although, the sandwich wasn't the best I'd ever had, the egg on top was definitely an incredible addition and also the inspiration for this Vietnamese Bowl. However, this bowl recipe is delicious even if you don't put an egg on it. All the fresh flavors compliment each other so well, and combined with all the different textures in this bowl, it adds up to a satisfying experience. As is common in Vietnamese Cuisine, all five senses get a workout! Make up the Pickled Vegetable Slaw first (click on link in the ingredient list below for recipe). You can make the pickled vegetables up several days in advance if you like. It's super easy to make and only takes a few minutes and you can use the Pickled Vegetable Slaw on many different recipes such as my Banh Mi Hot Dogs, Pulled Pork Banh Mi, or my Vietnamese Pork Sandwich Recipe. 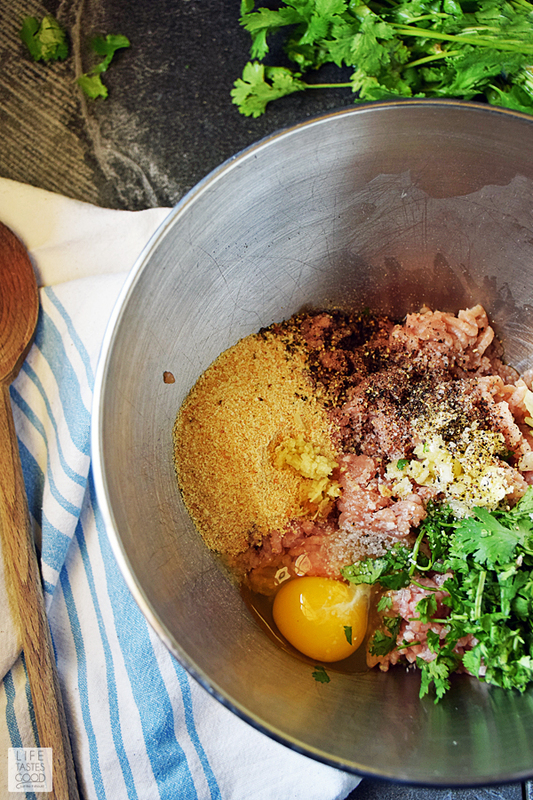 When you are ready to make the entire bowl, start with the meatballs. Prep the meatballs and get them in the oven. While the meatballs are baking, start the rice. While the rice and meatballs are cooking you have time to start the sauce and get that simmering. Chop the garnish to have it ready to go. Once everything is ready, go ahead and start the poached eggs while you are assembling the bowls. Top each bowl with an egg and enjoy! In a large bowl, combine 1 pound ground pork, 1/4 cup bread crumbs, 1 large egg, 2 tablespoons chopped fresh cilantro, 1 tablespoon freshly minced garlic, 1 tablespoon freshly minced onion, 1/2 tablespoon freshly grated ginger, 1/2 teaspoon kosher salt, and 1/4 teaspoon freshly cracked black pepper. Mix the pork mixture well to combine and then form into meatballs. I use a medium scoop to get them uniform in size. Place them on the greased rack or a lightly greased baking sheet and bake in the pre-heated oven for about 15 minutes or until cooked through and no longer pink inside. Cooking time will vary depending on the size of your meatballs. While the meatballs are cooking, get the rice going. In a large skillet, melt 2 tablespoons butter. Add 1 cup Basmati Rice and cook until fragrant and lightly toasted. The rice will have a wonderful nutty aroma. Add 2 cups water and 1 tablespoon chicken base. Reduce heat to mid-low, cover and cook about 15 minutes or until most of the liquid is absorbed. Remove from heat and let stand, covered, for 5 minutes. Uncover, season with salt and pepper to taste and fluff with a fork. While the rice and meatballs are cooking, start the sauce. I have to take a moment and praise this sauce. I could drink this sauce through a straw! It is so good! I use this sauce on my RITZ Spicy Asian Wings as well as my Spicy Ginger Chicken and Vegetables Over Rice. One of the best tips I can give you, is if you find something that works, like this sauce, use it over and over again in a variety of recipes. In a small saucepan, combine 1/2 cup apple cider vinegar, 3 tablespoons soy sauce, 1 cup brown sugar, 3 serrano chile peppers (seeded and minced), 1 tablespoon fresh grated ginger, and 1/2 teaspoon kosher salt. Give it a taste and adjust the seasonings as needed. Tip: Freeze the ginger for easier grating. Bring this mixture to a gentle boil, stirring frequently. Continue cooking and stirring until reduced down by 1/2 - about 10-15 minutes. The flavors will intensify as the sauce thickens and becomes syrupy. Toss the meatballs with the sauce. 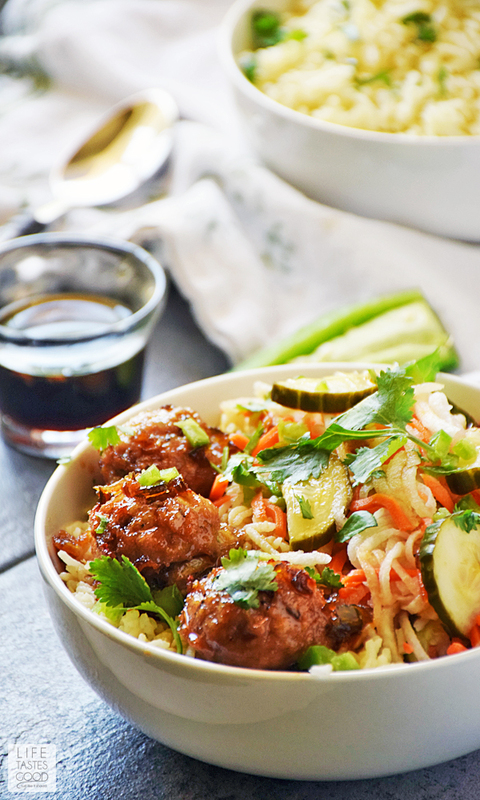 Divide the rice between 4 bowls and top each with 1/2 cup Pickled Vegetable Slaw, 3-4 meatballs, about a teaspoon of diced jalapenos, and some chopped cilantro. Top each bowl with a poached egg and enjoy! 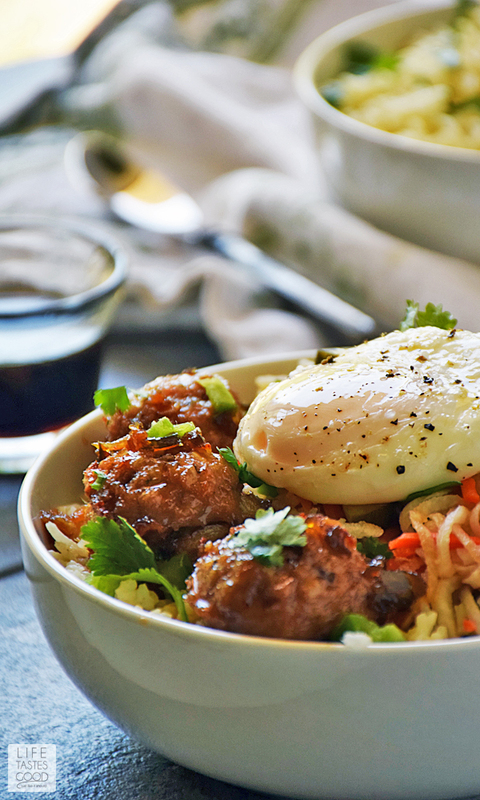 Vietnamese Bowl is a deconstructed Banh Mi Sandwich over rice topped with a poached egg. This is an easy recipe using fresh ingredients to maximize flavor! 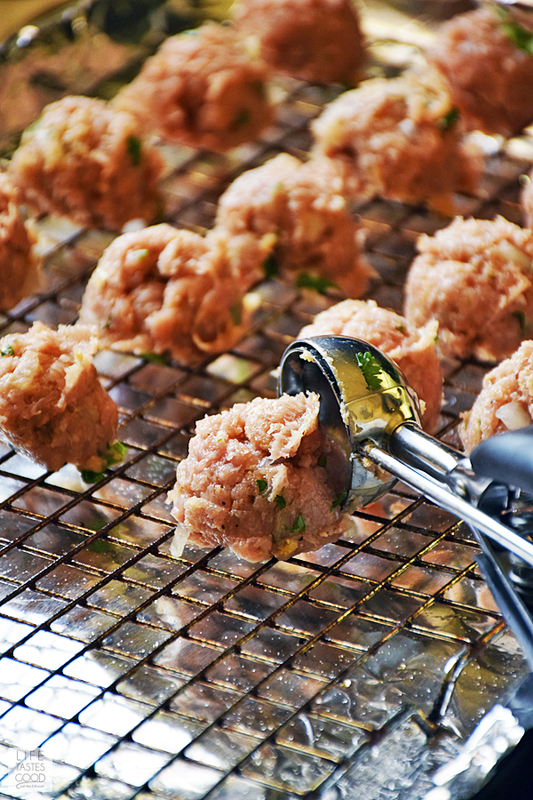 Mix the pork mixture well to combine and then form into meatballs. I use a medium size scoop to get them uniform in size, or if I'm away from home I have even used a 1/8 measure cup to measure the meat and then roll into a ball. Place them on the greased rack or a lightly greased baking sheet and bake in the pre-heated oven for about 15 minutes or until cooked through and no longer pink inside. Cooking time will vary depending on the size of your meatballs. While the meatballs are cooking, get the rice going. In a large skillet, melt 2 tablespoons butter. 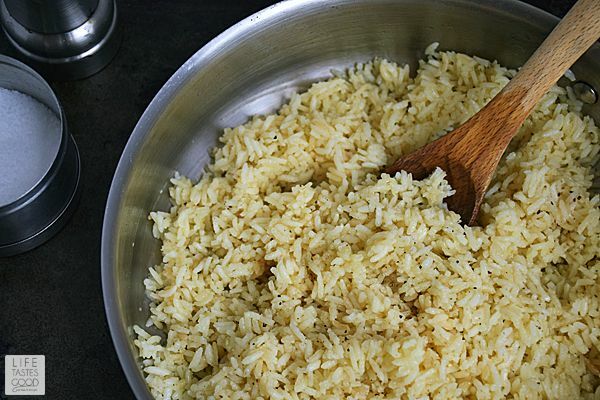 Add 1 cup Basmati Rice and cook until fragrant and lightly toasted. The rice will have a wonderful nutty aroma. Add 2 cups water and 1 tablespoon chicken base. Reduce heat to mid-low, cover and cook about 15 minutes or until most of the liquid is absorbed. Remove from heat and let stand, covered, for 5 minutes. Uncover, season with salt and pepper to taste and fluff with fork. While the rice and meatballs are cooking, start the sauce. In a small saucepan, combine 1/2 cup apple cider vinegar, 3 tablespoons soy sauce, 1 cup brown sugar, 3 serrano chile peppers (seeded and minced), 1 tablespoon fresh grated ginger, and 1/2 teaspoon kosher salt. Give it a taste and adjust the seasonings as needed. Tip: Freeze the ginger for easier grating. Bring this mixture to a gentle boil, stirring frequently. Continue cooking and stirring until reduced down by 1/2 - about 10-15 minutes. 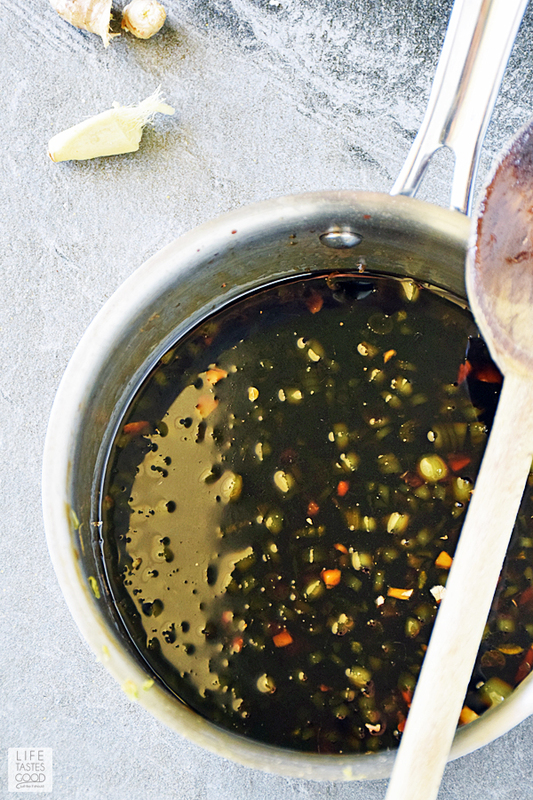 The flavors will intensify as the sauce thickens and becomes syrupy. Toss the meatballs with the sauce. 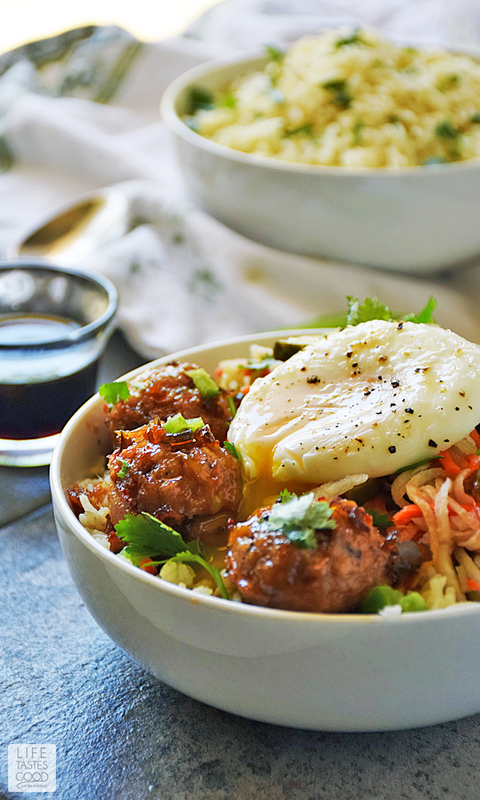 To assemble the bowls, divide the rice between 4 bowls and top each with 1/2 cup Pickled Vegetable Slaw, 3-4 meatballs, about a teaspoon of diced jalapenos, and some chopped cilantro. Top each bowl with a poached egg and enjoy! Just wanted to let you know I have now made this dish twice and loved it both times! Even my toddler enjoyed it!